Mrs. Giordano is out and a new substitute teacher name Miss Pelly comes to class. One student notices the change in routine and is not happy about it. Miss Pelly does not follow the rules like Mrs. Giordano, she says. 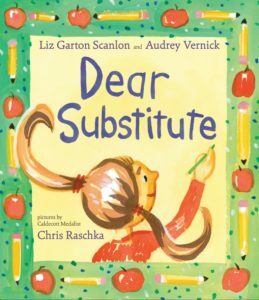 However, our student learns that even though the substitute may do things a little differently, and she may be a bit silly, mixing things up might not be so bad. The story is told in a series of adorable letters written as poems. This picture book is a great fit for classrooms and for any child nervous about new experiences. My 6-year-old daughter thought this book was really funny. She was able to read the entire book by herself and found it very relatable. She mentioned to me that many of her substitute teachers would do wrong things too! 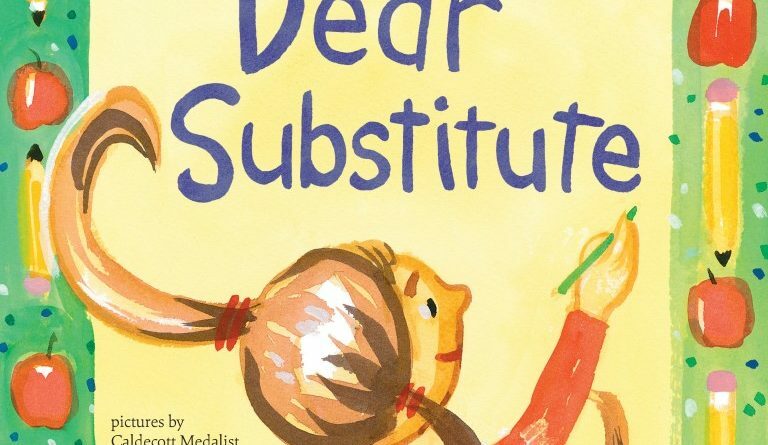 This book is about a young girl who gets a substitute teacher one day and finds that everything is going wrong. After some time, she realizes that change is sometimes good! I enjoyed the pages of letters she wrote to different things and people. I also liked how her attitude changed throughout the book and shows how sometimes it is good for changes. The illustrations in this book are simply adorable! The artist used a soft palette of watercolors where images were more abstract than realistic. I love this kind of artwork and enjoyed seeing it wrapped around the young girl’s letters. My daughter and I enjoyed the story and the lovely artwork in this picture book. The age range for this book is 3 – 7 years old. It is appropriate for school-aged children as that is when they will notice substitute teachers and changes in their usual routine. I would recommend this book for your personal library to teach children that change and doing things differently is alright.